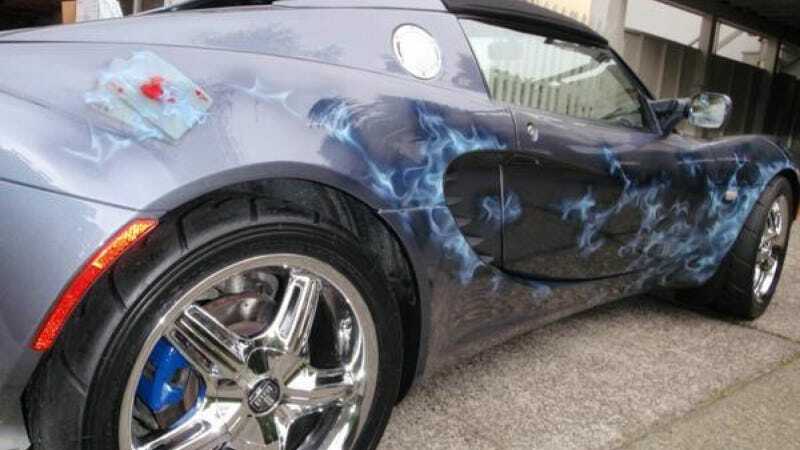 Reason 8,598,477 to lose faith in humanity: A man once woke up in the morning and said to himself, "Today I'm going to give my Lotus Elise a paint job with flaming electric blue playing cards." That's the case with this insult to good taste up for grabs on Vancouver Craigslist for $65,000 Canadian, which is a staggering, mind-boggling, what-sort-of-drugs-are-you-on $59,247 in American money. And in addition to that paint job, it has Lambo doors BECAUSE OF COURSE IT DOES. The good news (?) is that it's a low mileage 2007 model with only 23,000 km on the clock. The bad news is that it exists in the first place. Anyone think this car can be rehabilitated? It's not just some lameass sports car — it's an Elise. It deserves better than this. Someone, anyone, please save it.